Apple has created a new suite of development resources tailored specifically for the iPhone. Dubbed the "iPhone Dev Center," the service provides a range of resources, including guidelines for optimizing Web apps for the iPhone, sample code, video tutorials, and other reference material. The iPhone Dev Center is part of the Apple Developer Connection, a community of (primarily) Mac developers with a variety of online tools and resources. The new iPhone Dev Center, however, focuses exclusively on the iPhone. It includes Web development guidelines, videos covering technical issues (through ADC on iTunes), sample code projects for development and interface design, CSS and HTML references specific to Safari, etc. 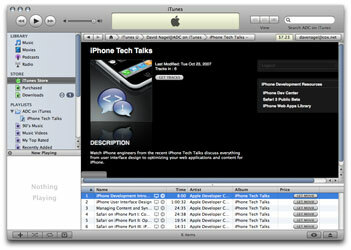 It also provides a link to submit iPhone-friendly apps to Apple's Web application library. The launch of the iPhone Dev Center comes on the heels of the release of Apple's iPhone sales figures, showing 1.12 million units sold in the company's fourth fiscal quarter (ended Sept. 29)--the first full quarter in which the iPhone was available. Total sales as of Sept. 29 (three months and change) were 1.39 million units. By way of historical perspective, the iPod sold 125,000 units in its first two months, and it took Apple 25 months to sell its first 2 million units. The iPod is now selling at a rate of more than 10 million per quarter. The iPhone Dev Center requires an Apple Developer Connection membership, which is available free through the the main ADC site or through the iPhone Dev Center.